The adorable girl from Boku wa Tomodachi ga Sukunai is finally getting the reservation order starting today. Yep, Nendoroid Kashiwazaki Sena is available for pre-order at your favorite figure stores. The beautiful girl who is always popular with the boys – but never has any female friends. 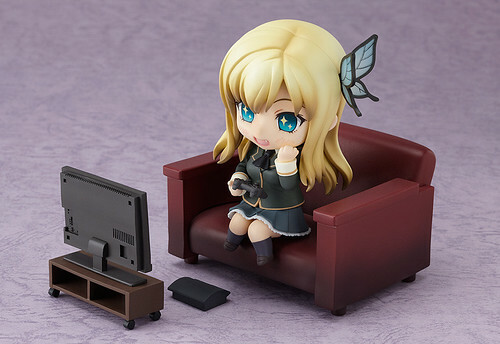 The anime based on a light novel series, ‘Boku wa Tomodachi ga Sukunai’, has finally started airing – and to commemorate, a Nendoroid of Sena Kashiwazaki is on its way! She comes with three expressions – her standard rather upset looking face, a crying face and an expression with sparkling eyes! She also comes with extra parts to recreate the Neighbor’s club clubroom, such as a TV set, a game console and a sofa! You can combine the sofa with the sofa included with Nendoroid Yozora Mikazuki to create a long sofa that both girls can sit on! Display her together with Yozora and let the rivalry between the two begin – in Nendoroid size! She is scheduled for March 2012 release (fortunately it’s not January XD) and she is going to be priced at …. a standard price of 3500 Yen!! Whoa … that’s quite a bargain, considering the amount of that extra parts and accessories that are going to be included in the package! This entry was posted in News and tagged boku wa tomodachi ga sukunai, boku wa tomodachi ga tsukunai, kashiwazaki sena, nendoroid. Yes, the price is very worth it.